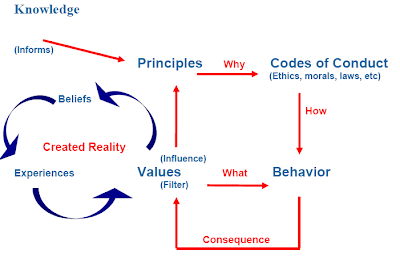 Minessence Values Framework [MVF] Knowledge-Base: What comes first - behaviors or values? What comes first - behaviors or values? Worldview (i.e. our self-constructed model of what we believe the world is all about) comes first. We hold certain things as important (i.e. our values) because of our view of the world. We do things based on choices determined by our values (i.e. we behave in certain ways). We view the consequences of our behaviours through the filter of our values. If our modus-operandi for living, based on our worldview isn’t working for us we may change our worldview, then we start the whole cycle again and, as we now have a different worldview, we now also have different values (or at the very least differently prioritised values), so we make different choices and engage in different behaviours, and so on the cycle goes. To change one’s worldview in the face of evidence that it is no longer working for us is normal behaviour. Conversely, the definition of insanity is, “Doing the same things in the same way, yet expecting different results” (Stephen G. Haines, The Systems Thinking Approach to Strategic Planning and Management, 2000, CRC Press LLC, Florida U.S, p. 284).